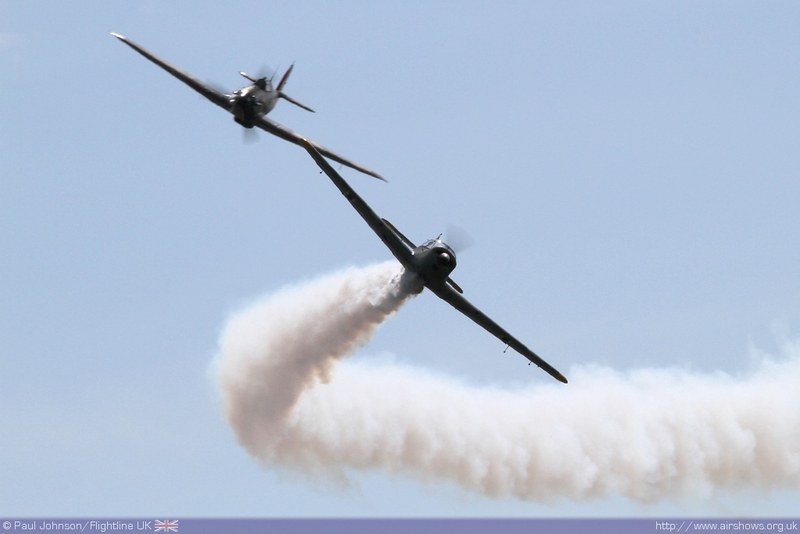 There are very few more iconic names in airshows than Biggin Hill. 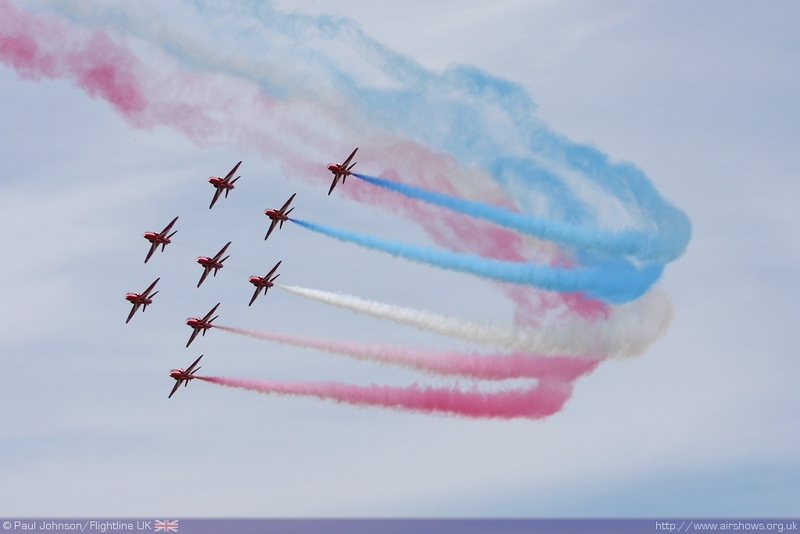 The International Air Fair is the biggest and longest running civilian airshow in the UK. 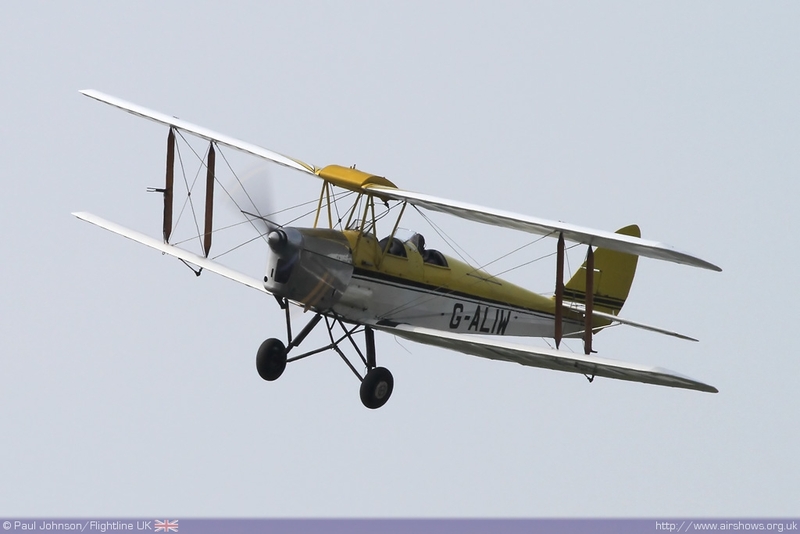 World famous for its rich and varied flying displays Biggin really is a must-attend event. 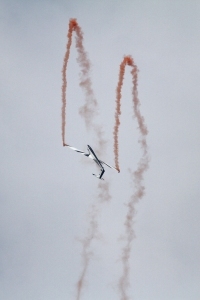 2010 saw that tradition continue with a colourful international flying display with everything from gliders to military heavy metal. 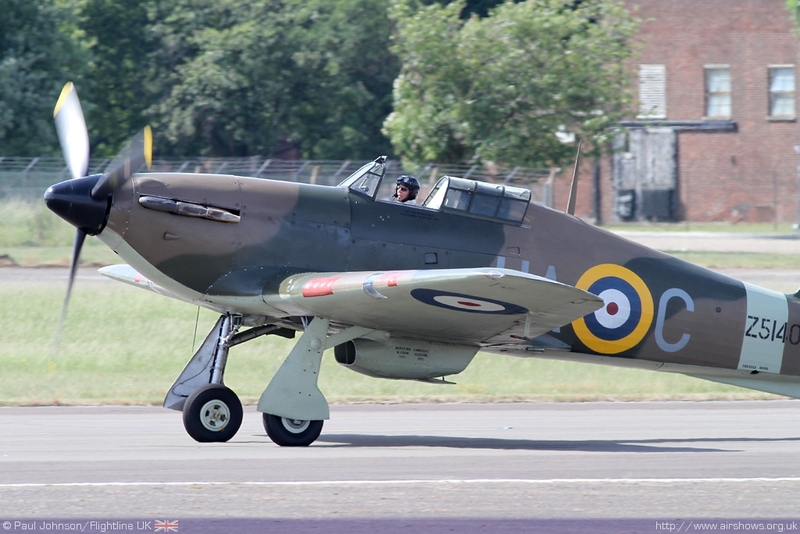 RAF Biggin Hill was perhaps the most famous fighter station of the Battle of Britain; so in this anniversary year where better to commemorate the sacrifice and achievement of the RAF in 1940? 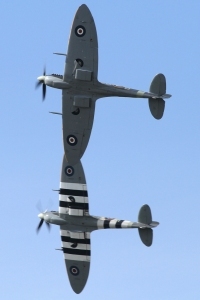 Over an hour of the flying display was given over to a "salute to the few" with participation from the Royal Air Force and a number of civilian warbirds recreating the heady days of Summer 1940. 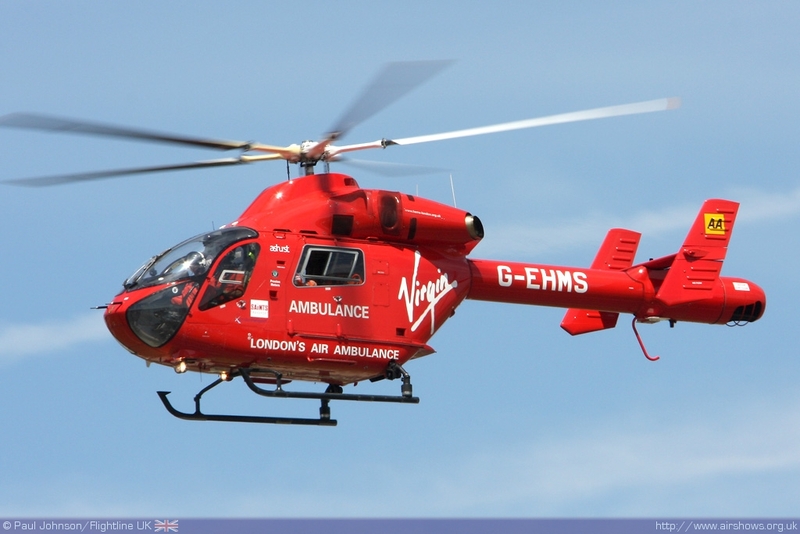 Paul Johnson/Flightline UK reports from a scorching weekend just outside London. 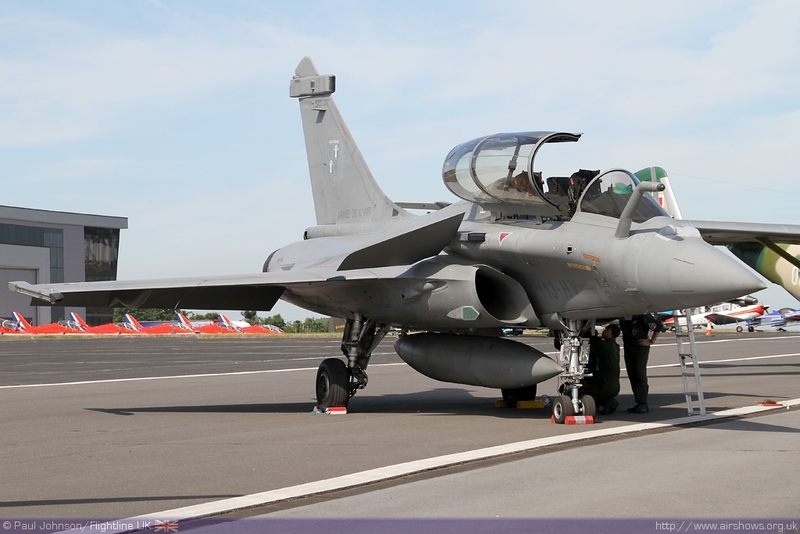 All photography copyright of the Author. . 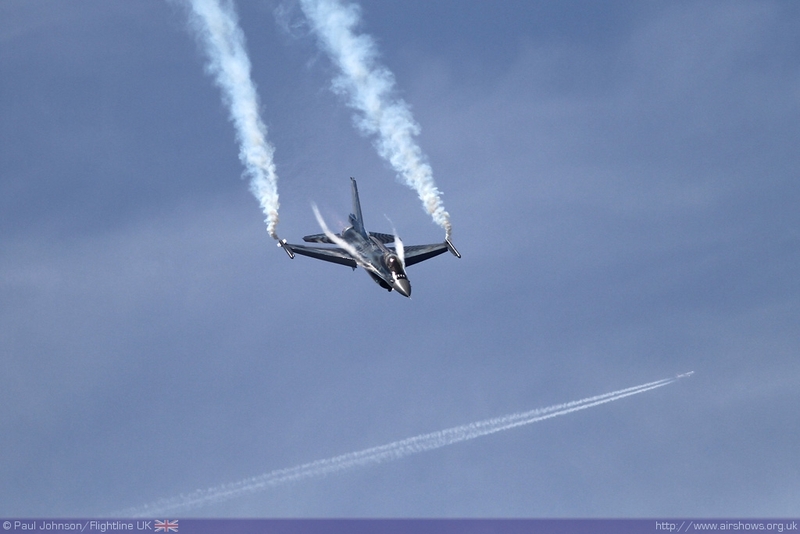 The Biggin Hill International Air Fair is always a highlight of my year and is one of my very favourite airshows. 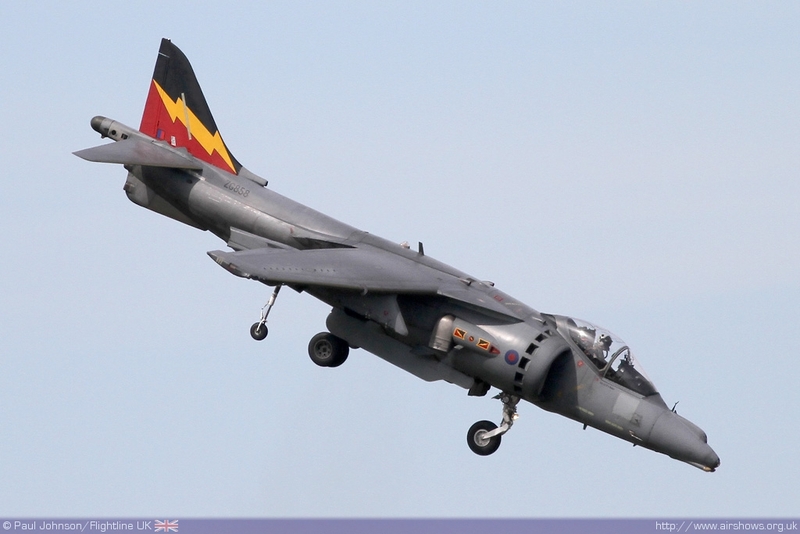 There no other airshow that attracts such a wide range of displays nor such history. 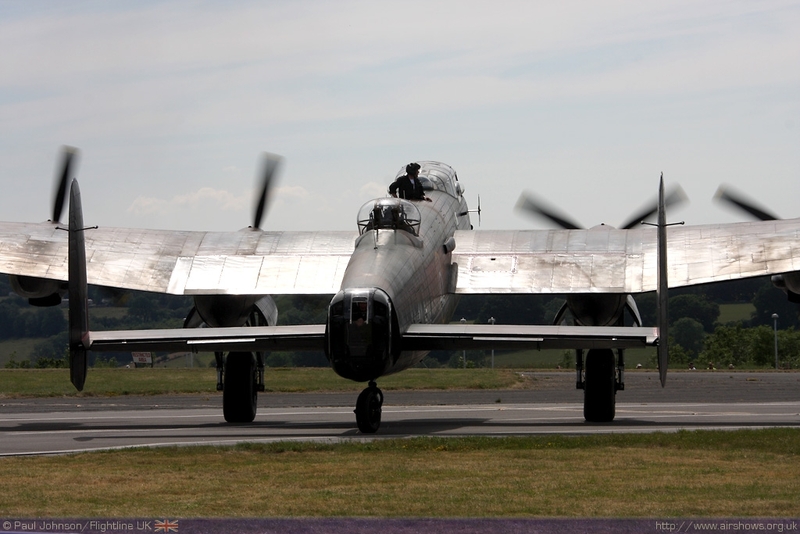 The mystique and stories that surround this airfield's wartime role just add to the atmosphere despite the radical changes to the airfield over the years. 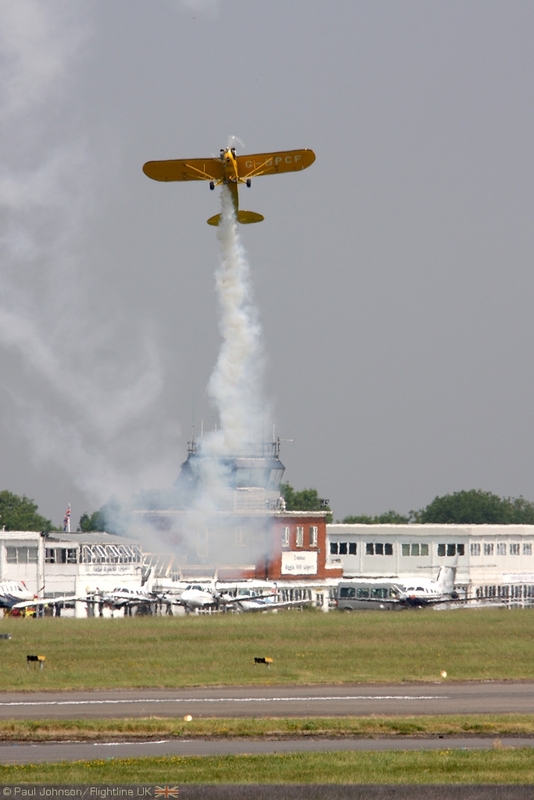 Today, Biggin Hill is becoming a small hub for executive travel. This is perhaps most obvious at the southern end of the airfield where a modern glass and steel hangar has just been completed for the Qatari company Rizonjet. 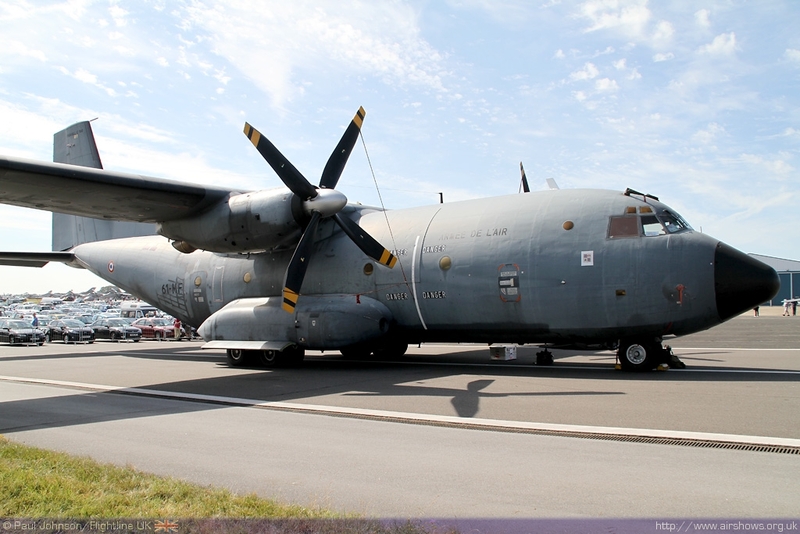 Other developments will also include a new luxury airport hotel as well as other companies moving to the airfield. 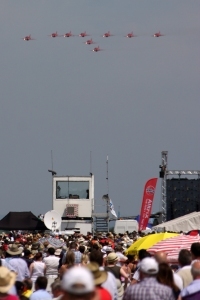 The airshow itself has grown over the years despite a number of threats to it's existence. 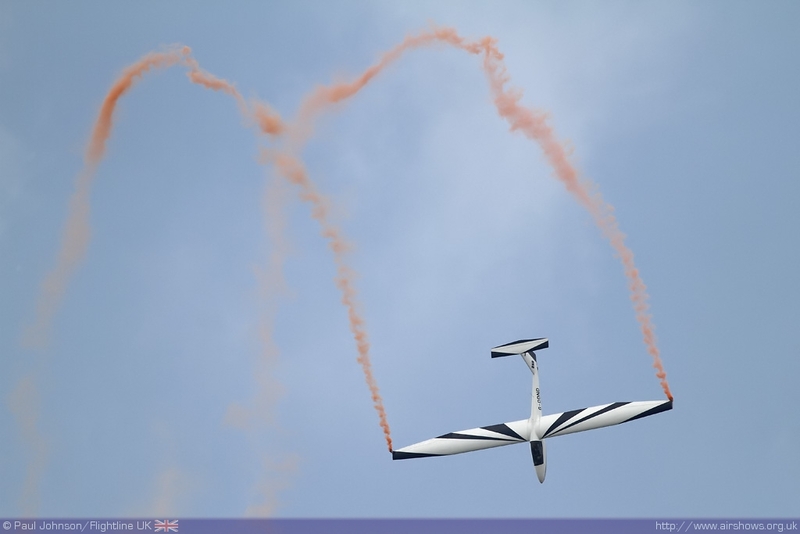 A lack of sponsorship and the construction of new housing estate opposition the main camp were amongst the most prolific threats but the show's organisers, Air Displays International have prevailed and grown the show to one of the very best in the UK. 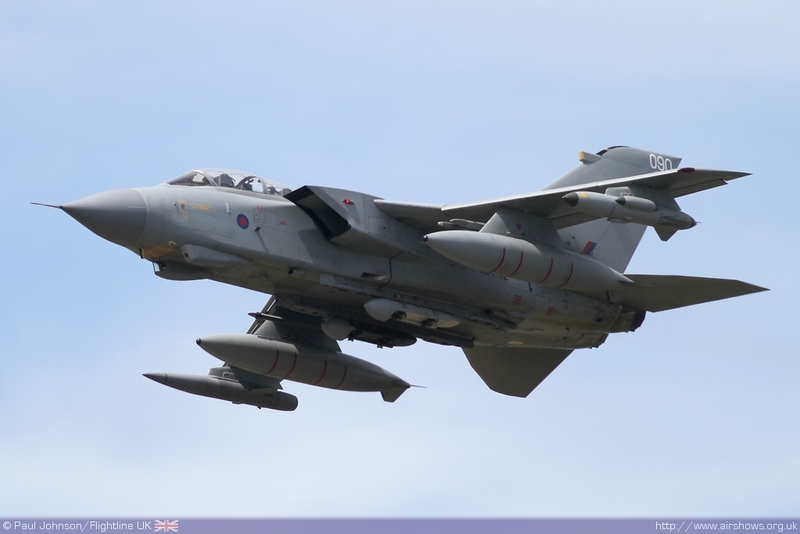 The Royal Air Force too has singled out Biggin as one of their priority shows and 2010 saw perhaps the strongest support ever - even stronger than some of the support for the services own airshows! 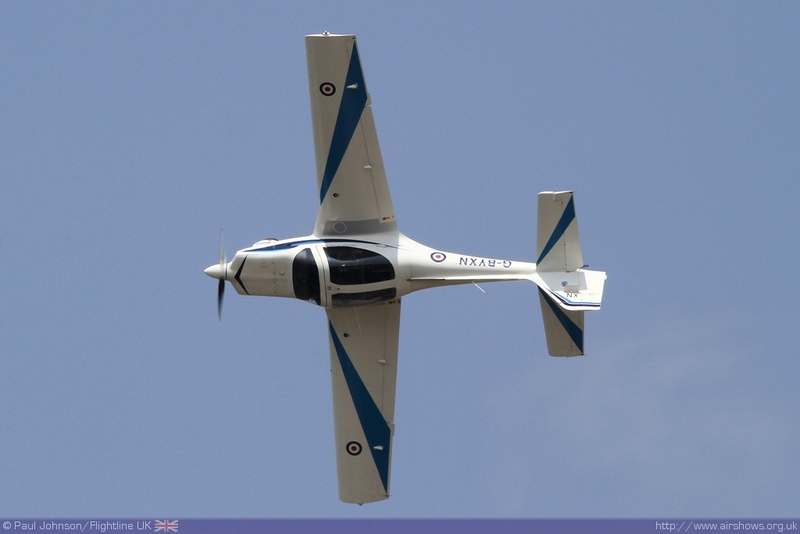 It's unsurprising that the Air Fair attracts a large audience from the across the UK and beyond. Over 100,000 people attended this year's show, with 60,000 on the Saturday alone. Sunday's audience may have been slightly down, but the show was competing with the World Cup football match between England and Germany and perhaps also the extreme heat! To say Biggin has been very lucky with weather over the last few years would be an understatement; 2010 carried on that luck with two very hot summer days with Sunday perhaps being a little too uncomfortable! 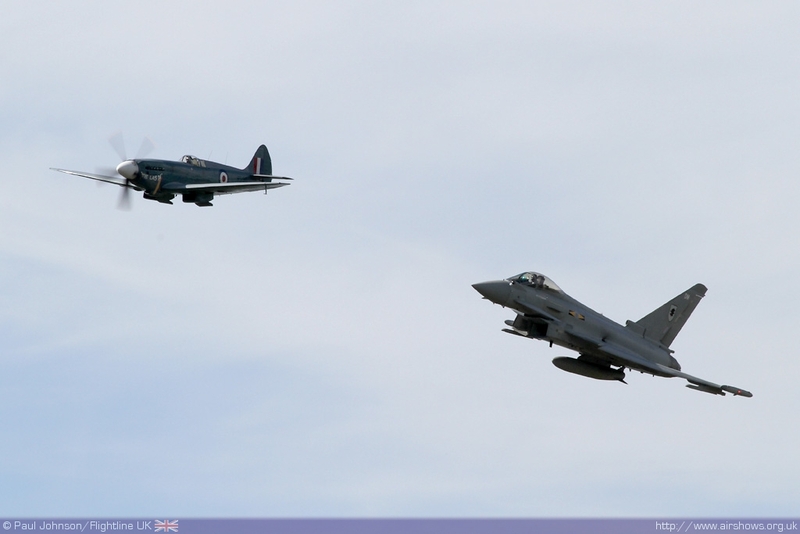 The centre piece for this year's flying display was a very special celebration of the 70th Anniversary of the Battle of Britain with commentary from Andy Pawsey. 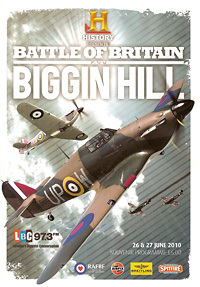 Biggin Hill's name is synonymous with the Battle of Britain and is the RAF's most famous fighter station from the period. To the west of the airfield, the main RAF camp remains intact, but mostly empty. The camp also contains the RAF Chapel with its commemorative stained glass windows. The other side of the airfield also contains signs of it past, with some of the original 1940 fighter pens, some still showing bomb damage. Within the showground, there was a large 1940's camp put together by "Their Finest Hour" who are also producing the DVD of the Air Fair. 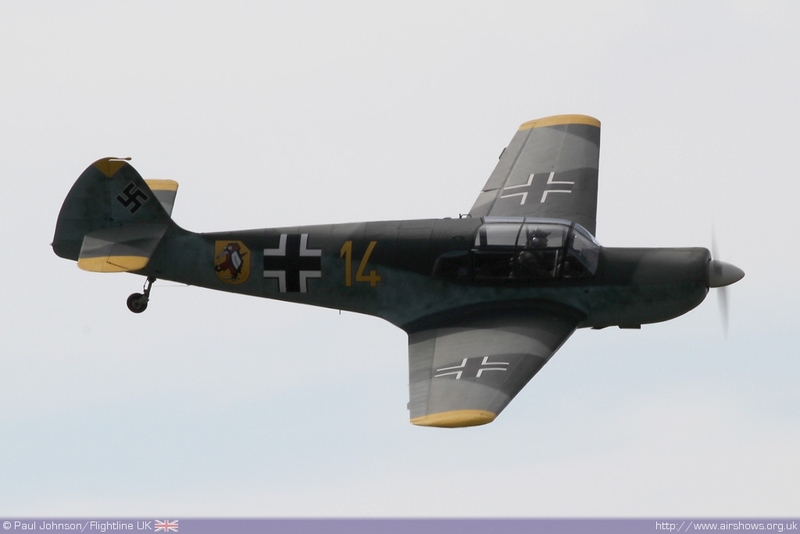 Amongst their fleet are a dozen Smart Cars carrying schemes representative of Spitfires and Messerschmitts! 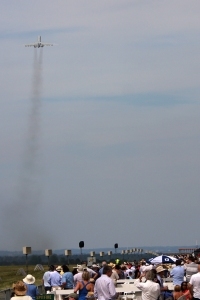 It the flying display, there was a very special sequence of displays that started off with a look at pilot training on both sides. 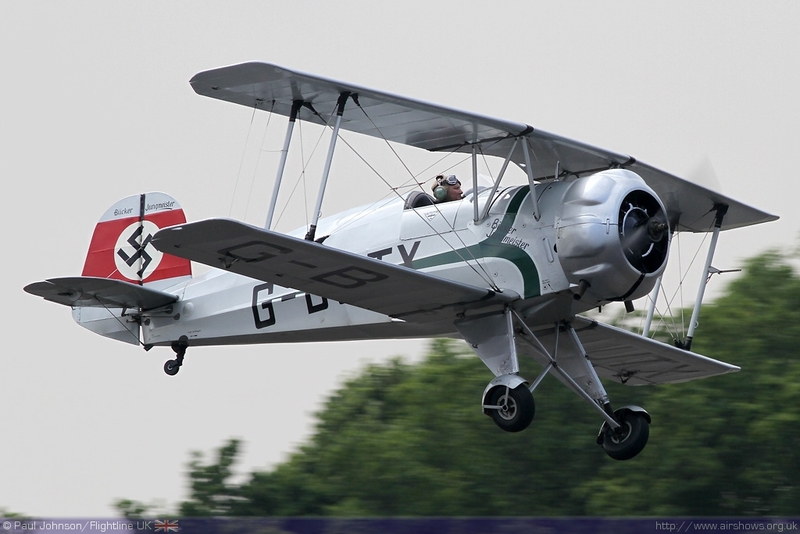 "Strictly Flying" provided a Tiger Moth which flew with a Bucker Jungmeister to represent the first trainers that pilots honed their skills on. 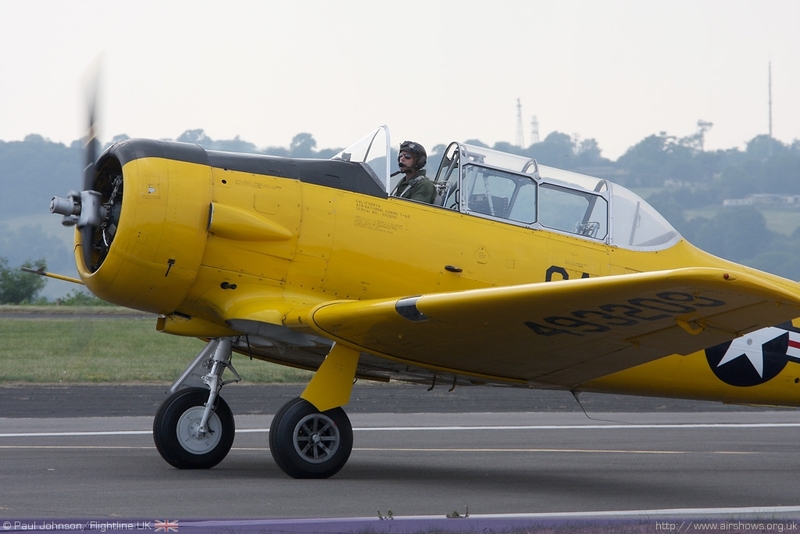 They were joined by local pilot Sam Whatmough displayed the Harvard advanced trainer from Classic Flight Experiences resplendent in its Air National Guard colours. 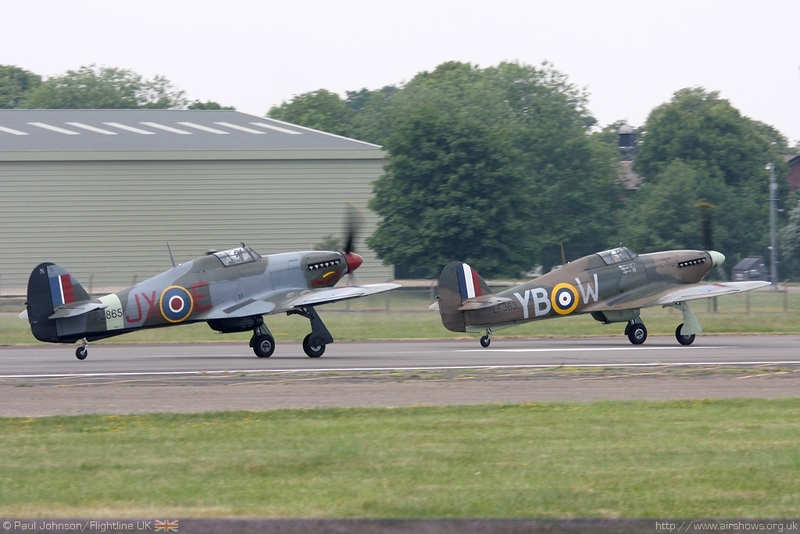 The training aircraft were soon followed by the first appearances of a Spitfire and Hurricane in the guise of Wings Ventures gorgeous Spitfire Ia AR215 and Peter Teichman's Hurricane IIb. 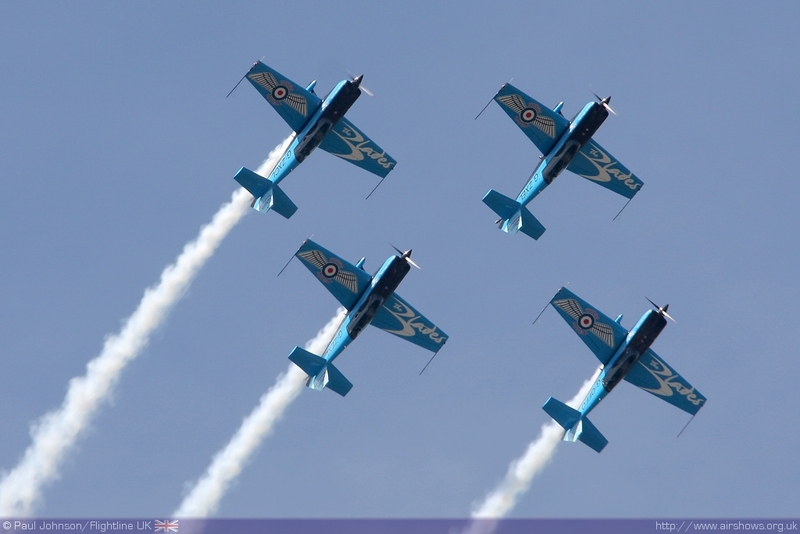 This first formation stayed with the "training" theme representing a couple of newly qualified pilots learning to fly these fighters for the first time. 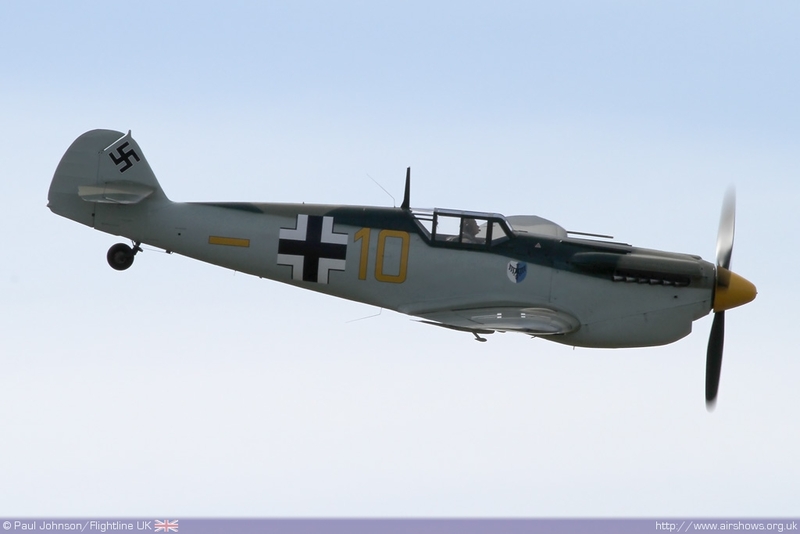 They were soon bounced by the Aircraft Restoration Company's Hispano HA1112 Buchon masquerading as a Me109 flown by John Romain and the Messerschmitt Me108. 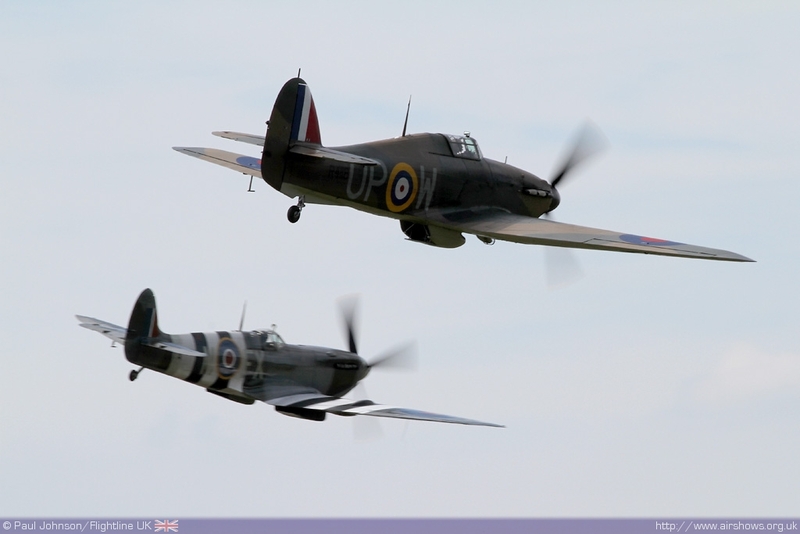 The trainees escaped as a further Spitfire and Hurricane appeared, this time Spitfire IX "Spirit of Kent" and Peter Vacher's Hurricane I which went on to dogfight with the invading fighters. 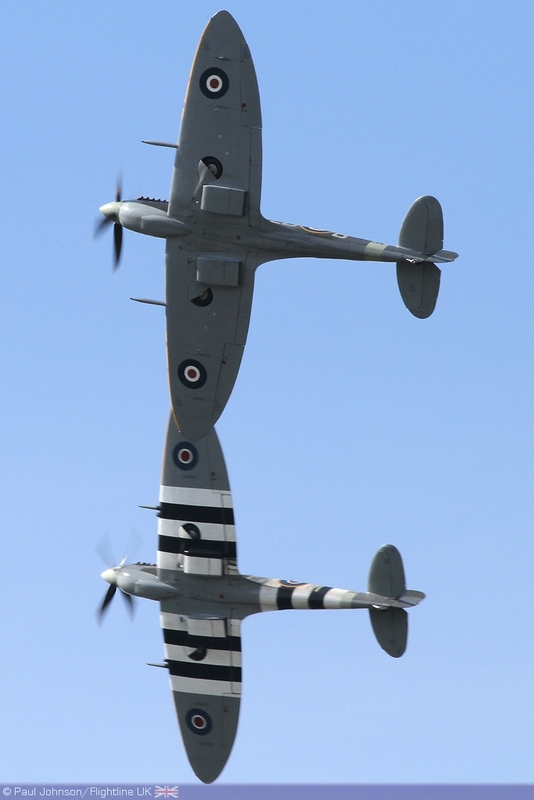 The dogfight, particularly between the Spitfire and Buchon, were very authentic with the aircraft weaving their way around the blue skies over Biggin. 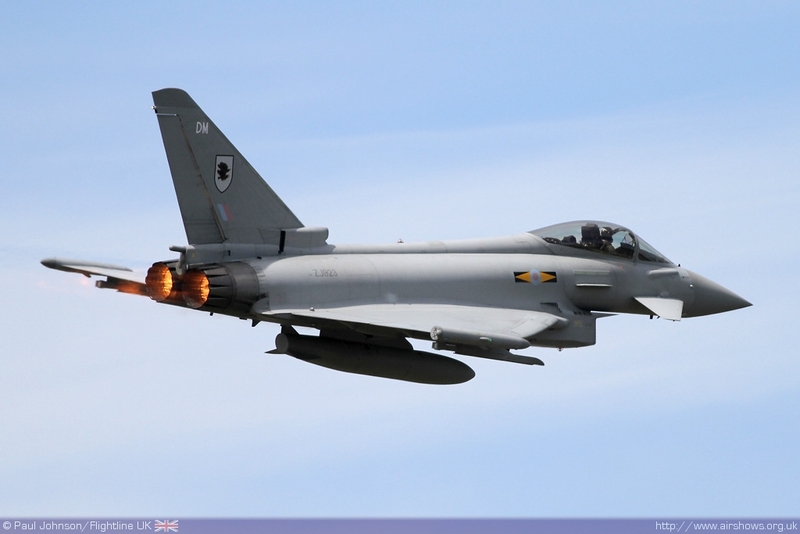 Eventually however, the German aircraft were repelled as another wave of RAF fighters got airborne. This part if the sequence was truly exceptional. 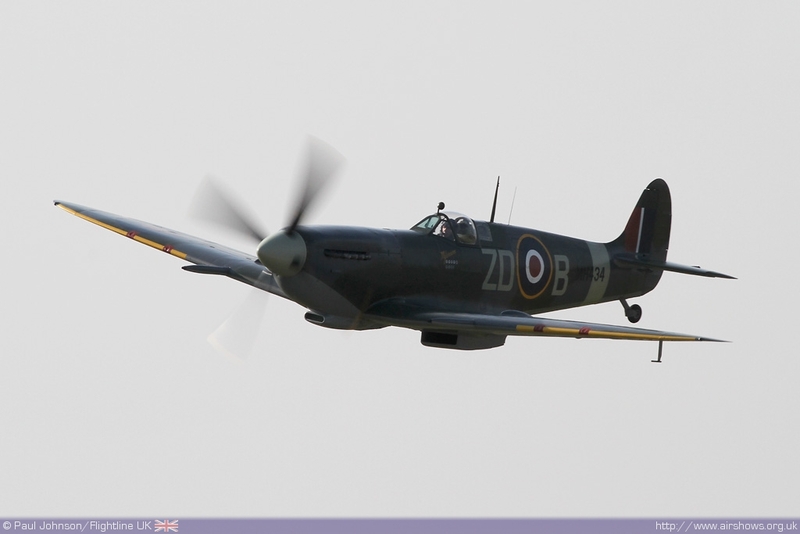 As the fighters formed up behind the crowd, pyrotechnics and audio footage recreated a raid on Biggin Hill Airfield. 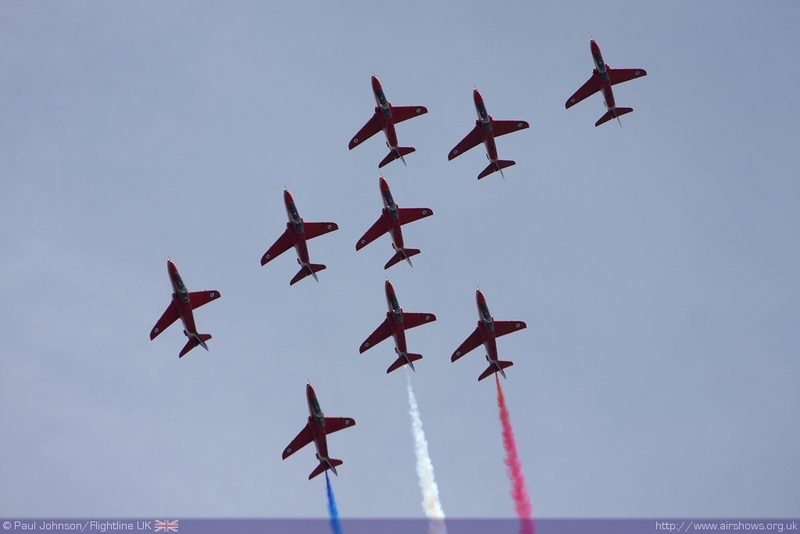 The formation of eight fighters that return was very special. 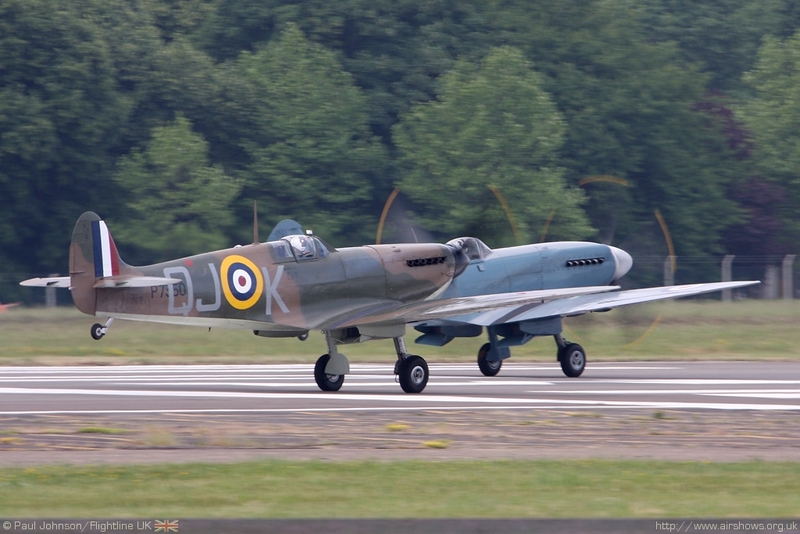 The first wave was lead by Kent Spitfire IX flown by Dan Griffiths. 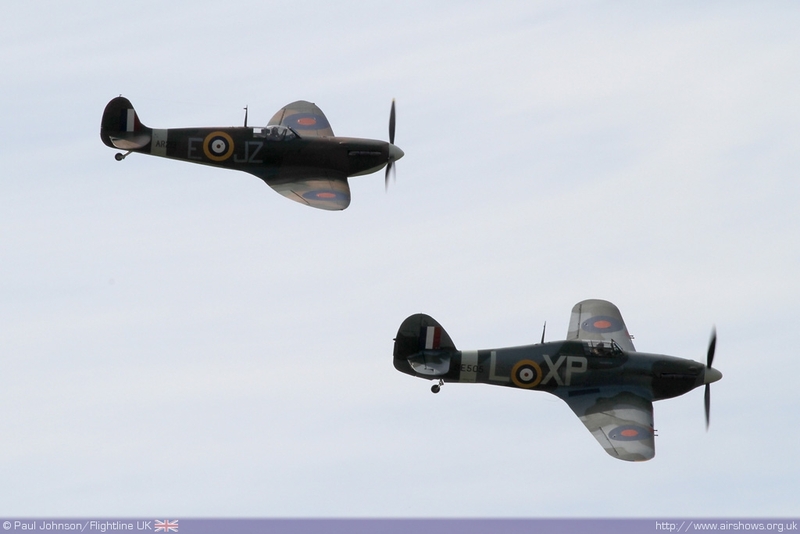 He was joined by Anna Walker in HAC's Hurricane XII, Peter Vacher's Hurricane I and Nigel Lamb in Spitfire IX MH434. 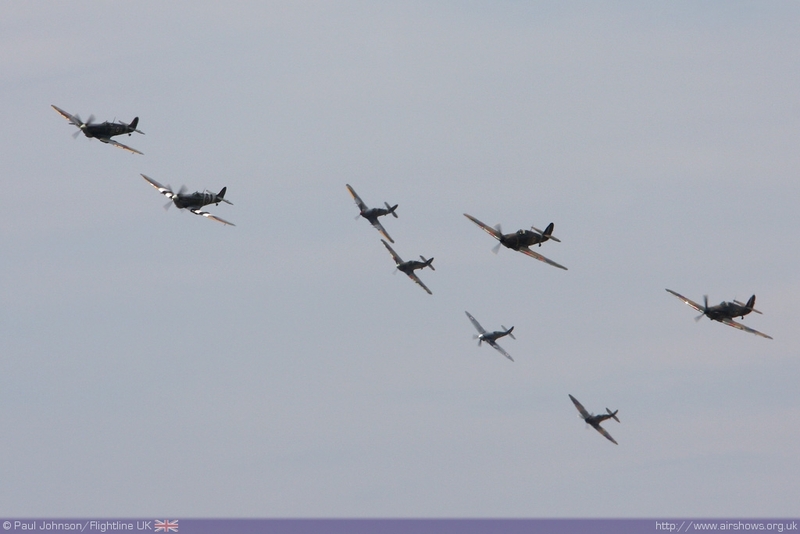 The second wave, performing a missing man formation consisted entirely of machines from the Battle of Britain Memorial Flight; both Hurricane IIcs, the Spitfire IIa and a Spitfire PR XIX. 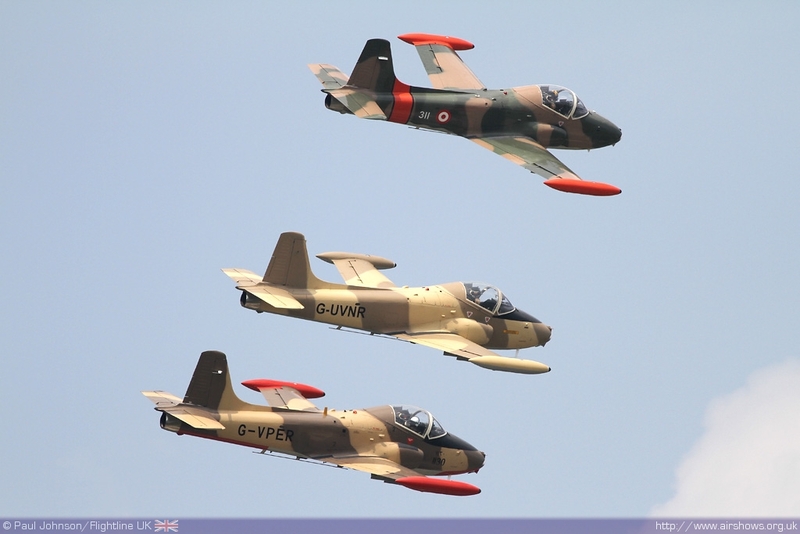 After the PR XIX had pulled away during the missing man formation pass, the rest of the fighters provided a rousing finale wheeling around tke sky in a seven strong tailchase. 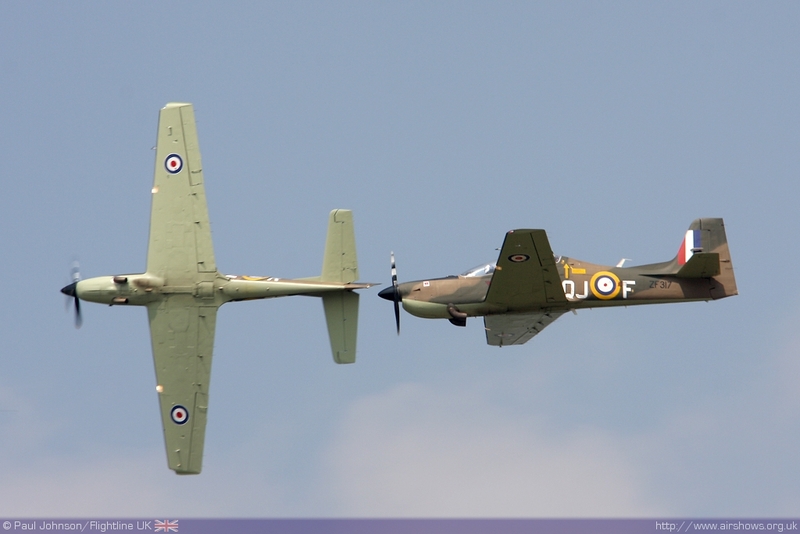 To have a mix of civilian and BBMF aircraft together was very special, particualrly at Biggin Hill. The entire sequence may be a little drawn out, but it was certainly spectacular with some great touches. As well as flying in the Battle of Britain sequence, the BBMF's Spitfire PRXIX also displayed alongside an RAF Typhoon FGR4 for the unique "synchro pair" which will be seen at some of the most high profile RAF events. 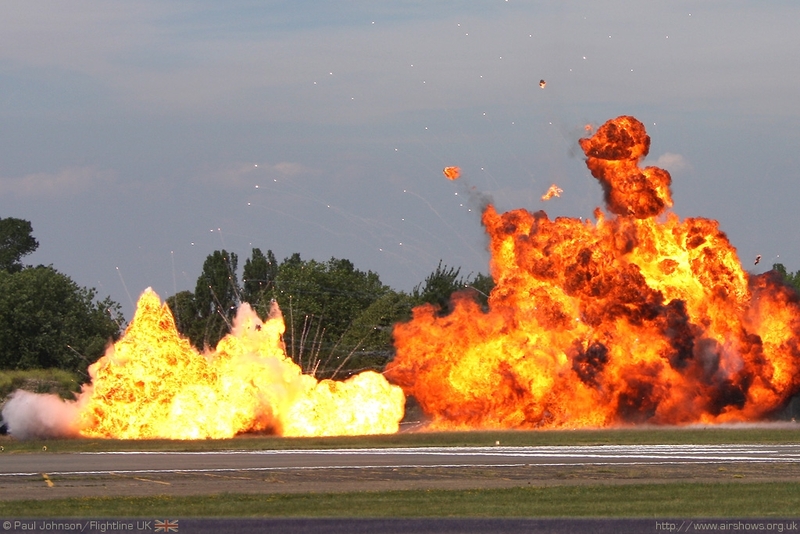 This display was a real coup for Biggin and it is a truly spectacular display. 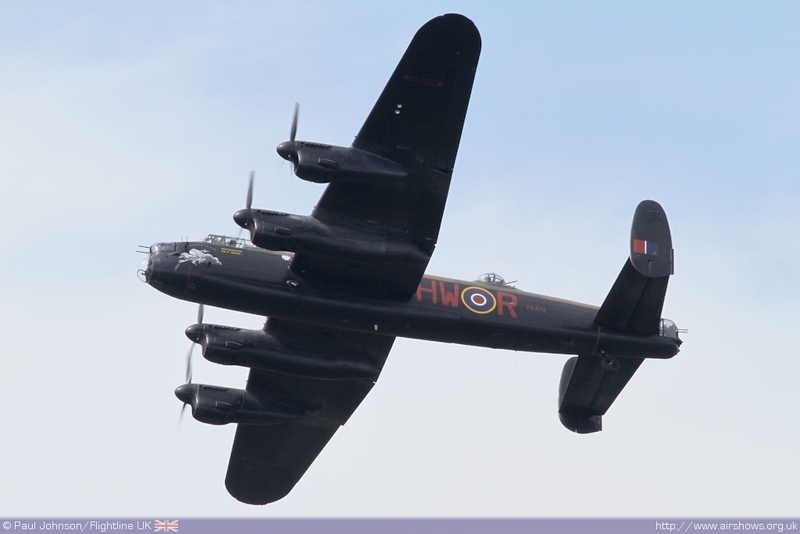 On top of the fighter, the flight's Avro Lancaster also performed a solo display each day. 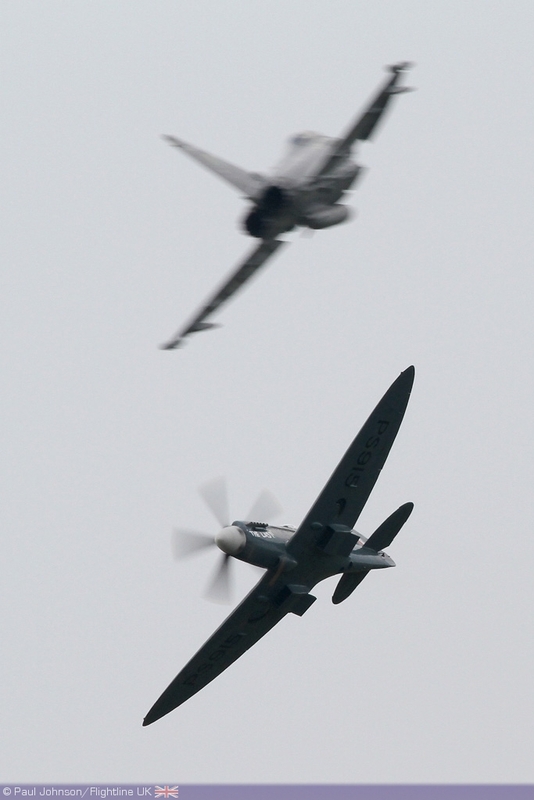 On top of the BBMF's contribution, the support from the Royal Air Force for this year's show was superb. 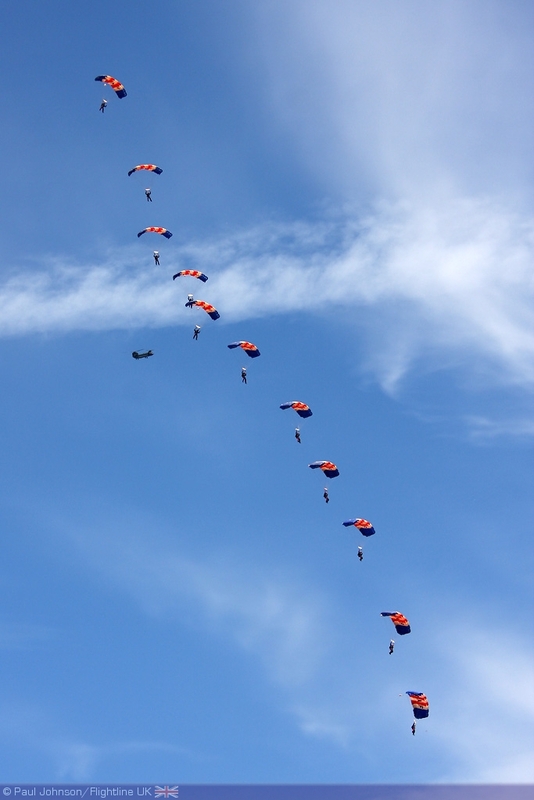 One of the first acts of the day was the RAF Falcons Parachute Display Team dropping from an RAF Chinook HC2 - a very rare occurrence in 2010. 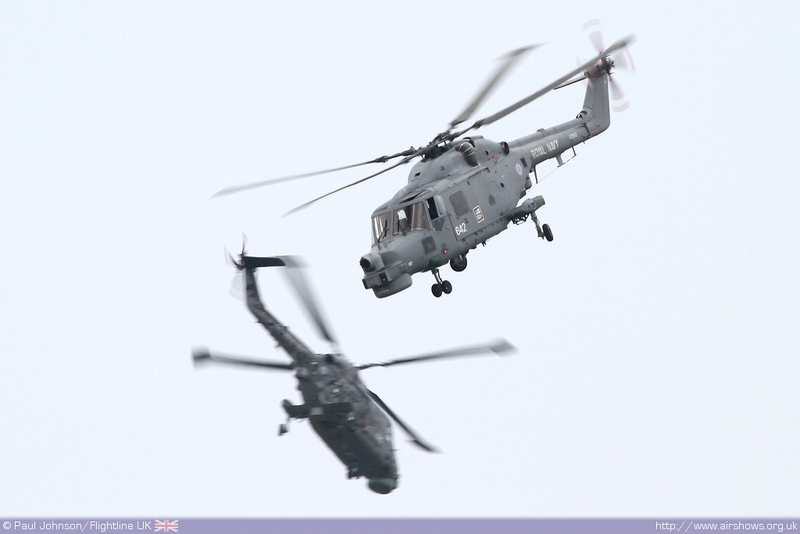 The Chinook was available as Biggin host the debut display of the new Chinook Role Demonstration. 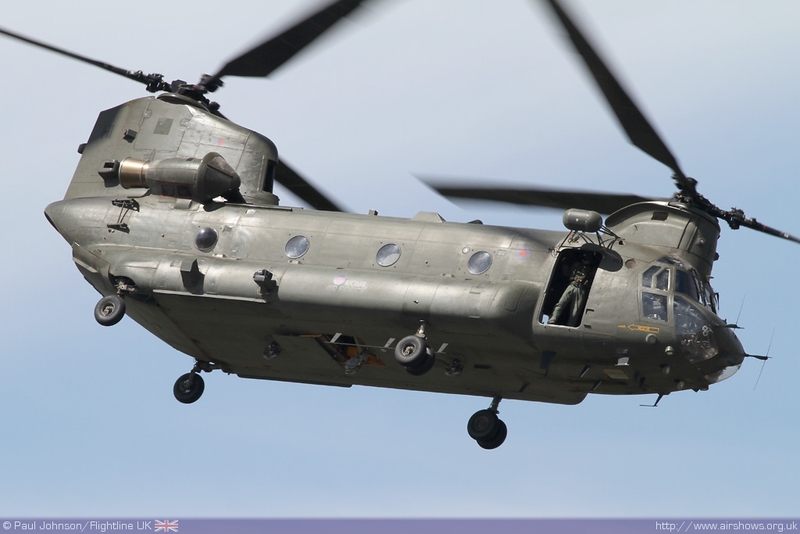 Rather than a display of the Chinook's agility the “Role Demo” presents a number of different capabilities of the Chinook that the RAF regularly uses in Afganistan such as under slung and internal loads (with Land Rovers) and fast roping by a number of ground troops. 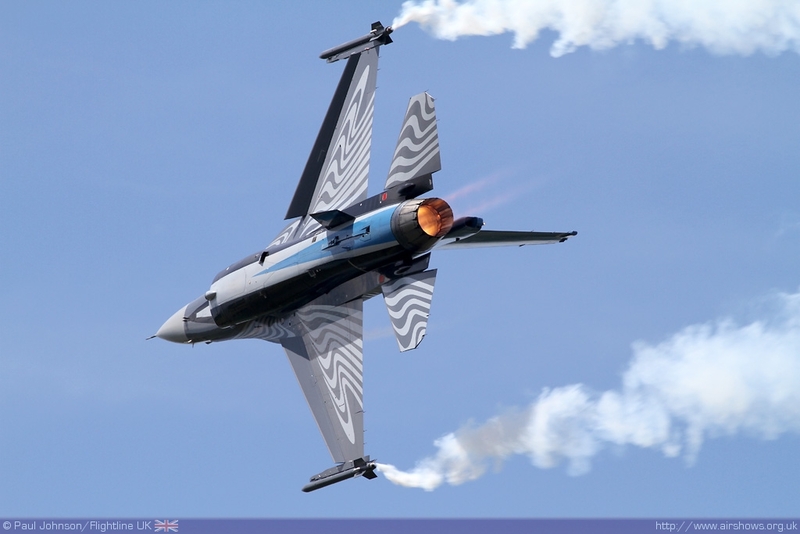 The demonstration will be a feature of Waddington, RIAT and Farnborough airshows and is a welcome addition to the circuit this year. 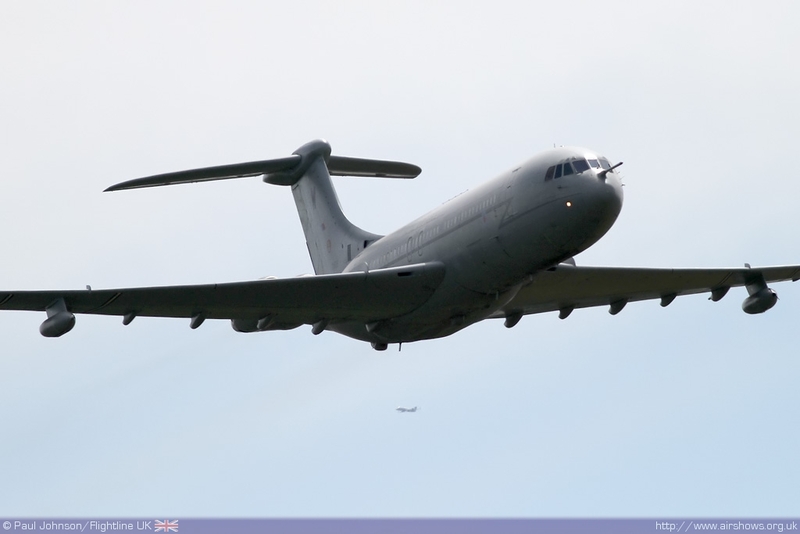 Another special from the RAF was a VC-10 from RAF Brize Norton which arrived during Saturday's display before departing on Sunday. 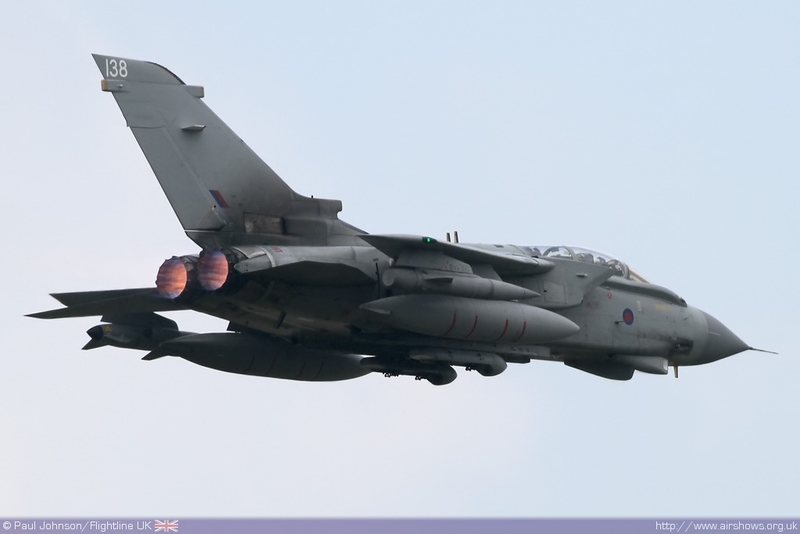 The large tanker made for an impressive sight within the tight confines of Biggin Hill. 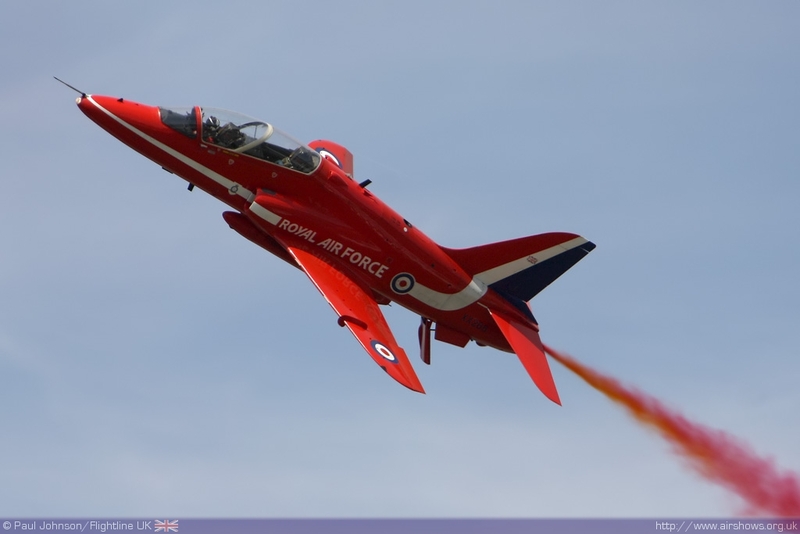 Equally spectacular, as they always are, were the Red Arrows making a welcome return to Biggin Hill. 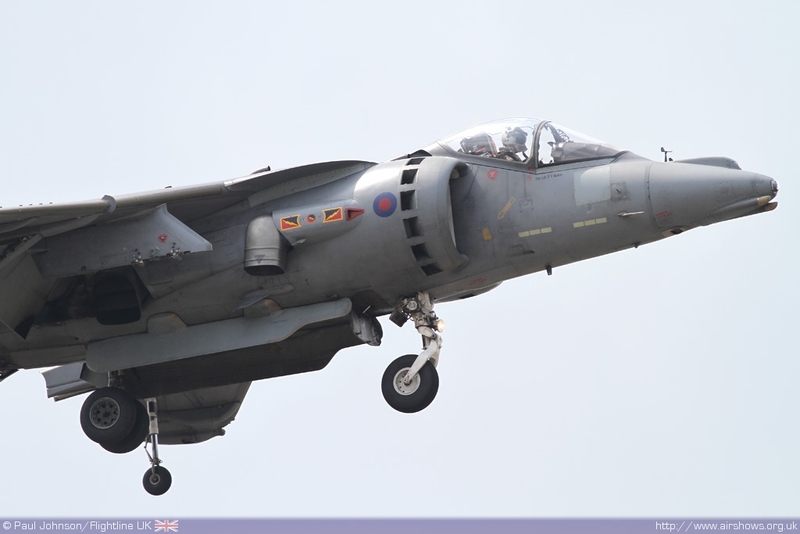 The show also featured the Typhoon, Hawk, Tucano and Tutor displays, aswell as both the new Harrier GR9 and Tornado GR4 role demonstration teams which made welcome appearances completing the full line up of RAF displays this year. 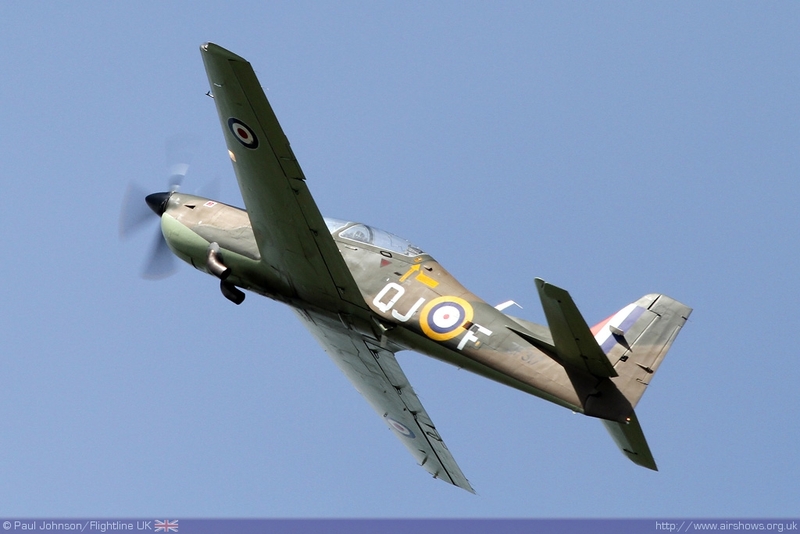 The Tucano display also scooped the prize for best solo display! 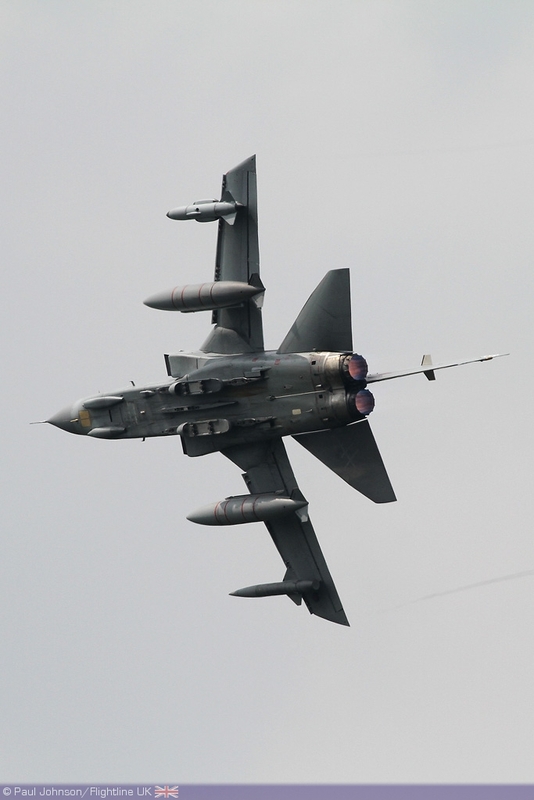 It was not just the RAF representing the modern day armed forces. 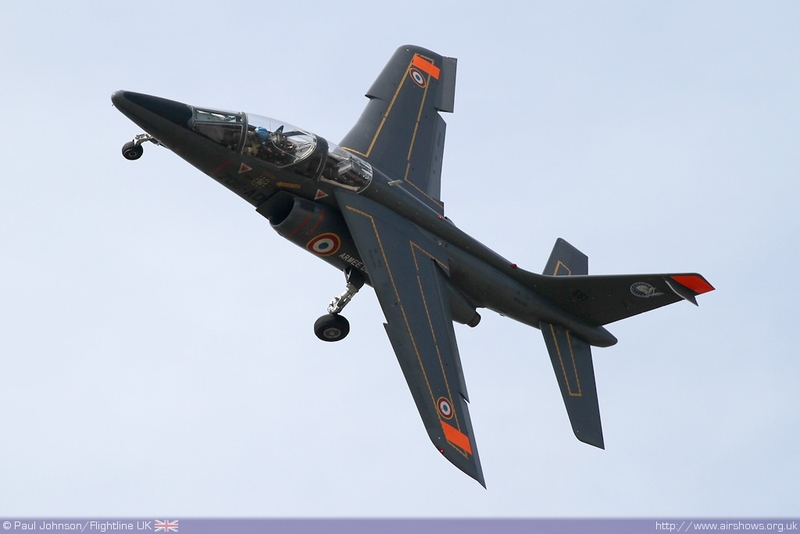 The Royal Navy's Black Cats displayed more rotary magic during the afternoon flying display while the French Air Force's nimble Alpha Jet also impressed. 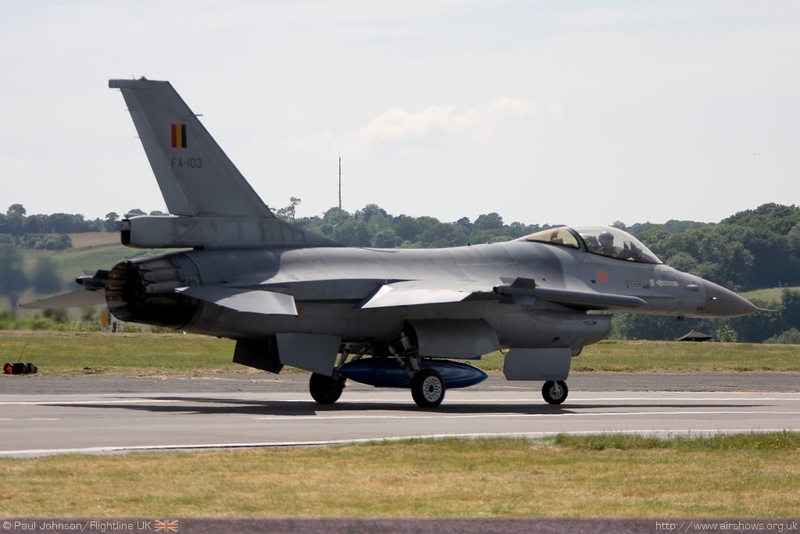 But one of the real show stars was the Belgian Air Component's F-16AM Fighting Falcon solo display which sports a stunning paint scheme for the 2010 display season. 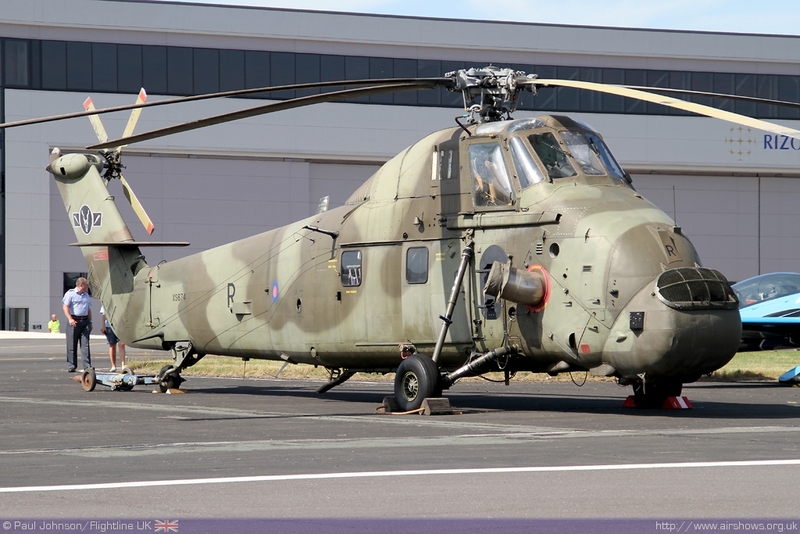 There were further military gems on static display with the RAF's Merlin HC3, Hawk T1, a Polish Air Force An-28 and a French Air Force Rafale B and C-160 Transall. 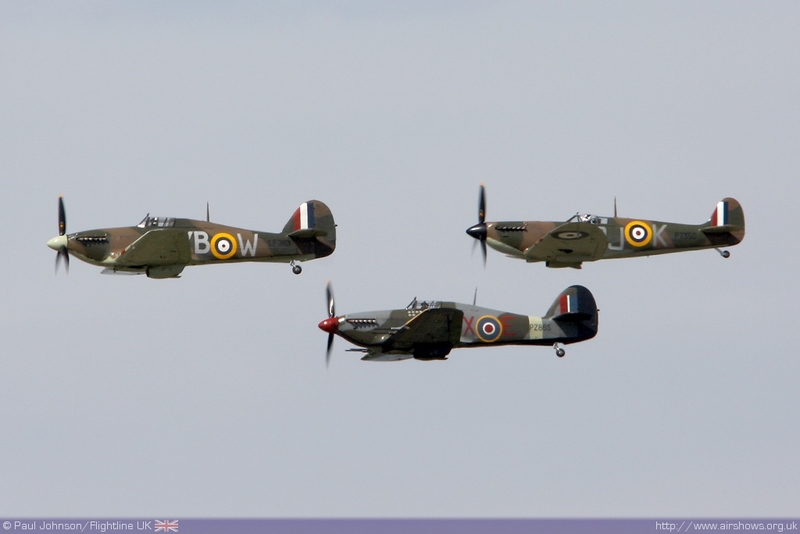 On top of all the Battle of Britain flying, there were other representatives from the RAF's history in the flying display. 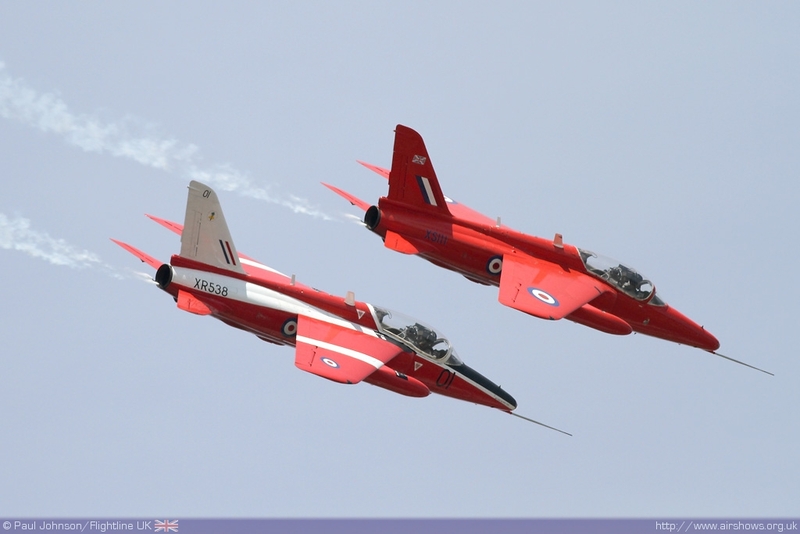 The Gnat Display Team displayed their wonderful pair of Folland Gnats. 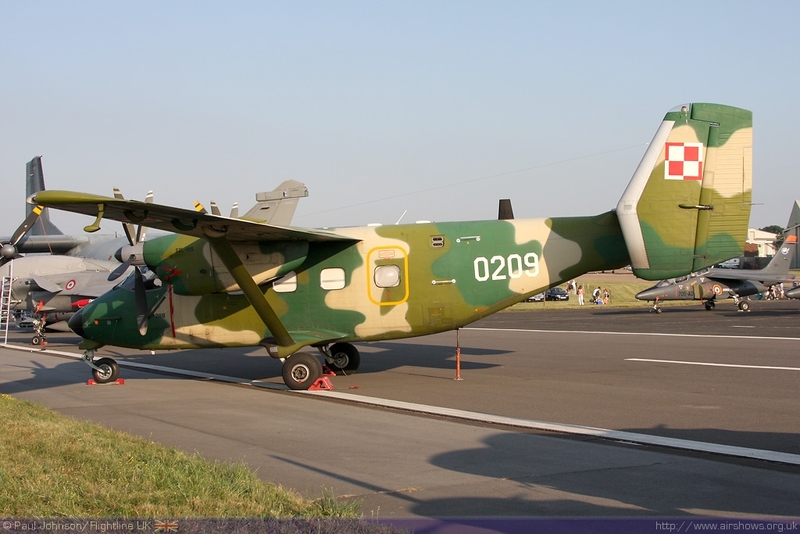 The team announced it has recently acquired a third aircraft and hopefully three ship displays will take place in the near future. 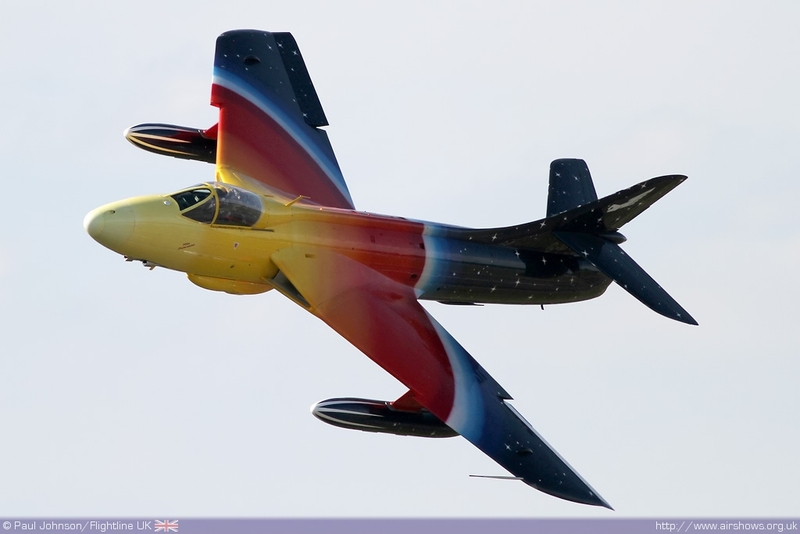 Joining the Gnats was Jonathon Whalley's beautiful Hawker Hunter F58a Miss Demeanour with his usual punchy display routine. 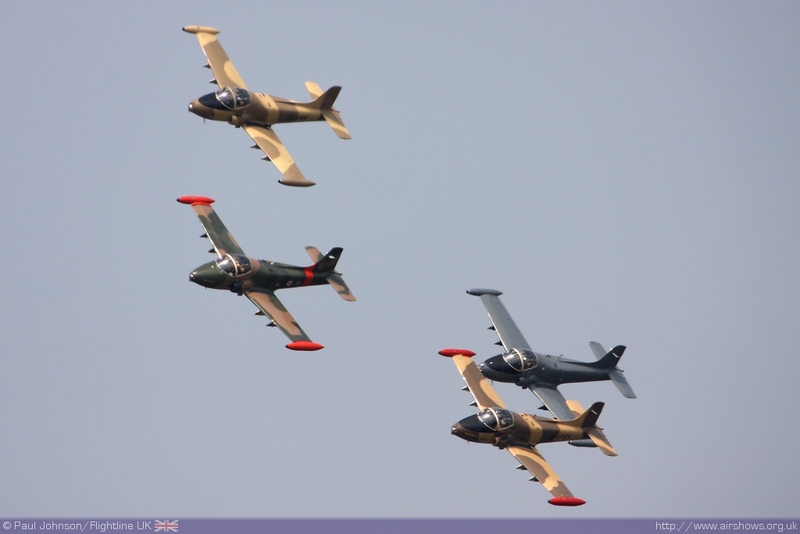 Team Viper also displayed on the Saturday with a full four-ship of Strikemasters. 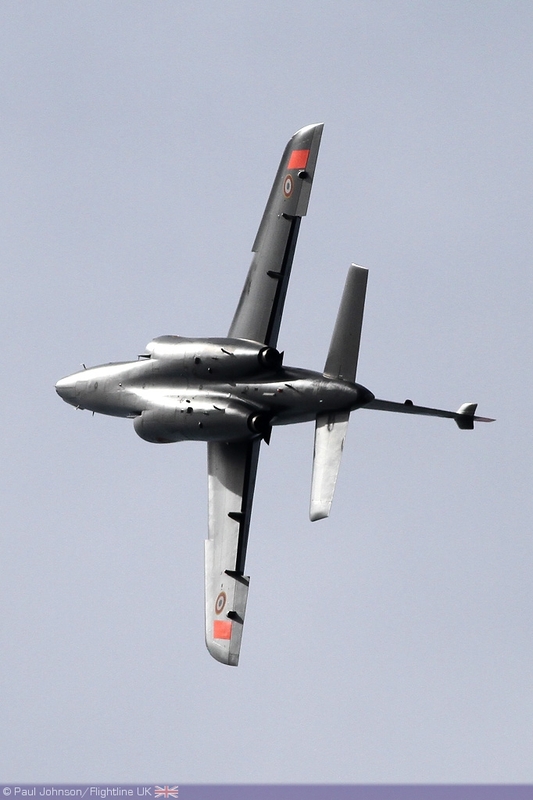 They will soon start converting to the Hawker Hunter, and by September should be flying a four-ship! 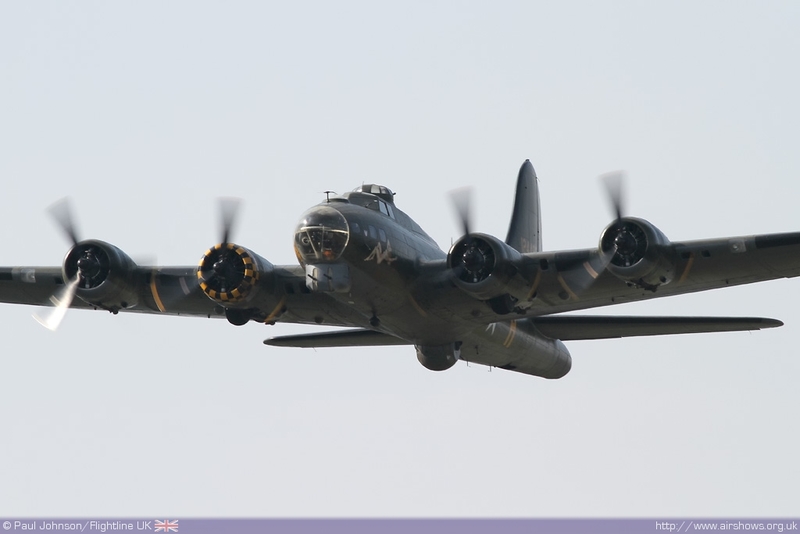 Moving to an earlier age, B-17G Flying Fortress Sally-B made a welcome return to Biggin Hill representing the exploits of the USAAF bomber force during the Second World War. 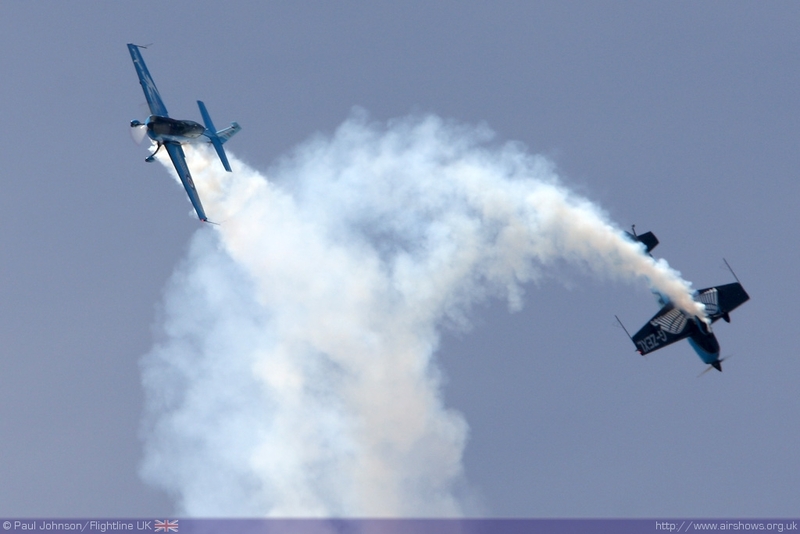 Biggin would not be the same without a selection of the best civilian display acts. 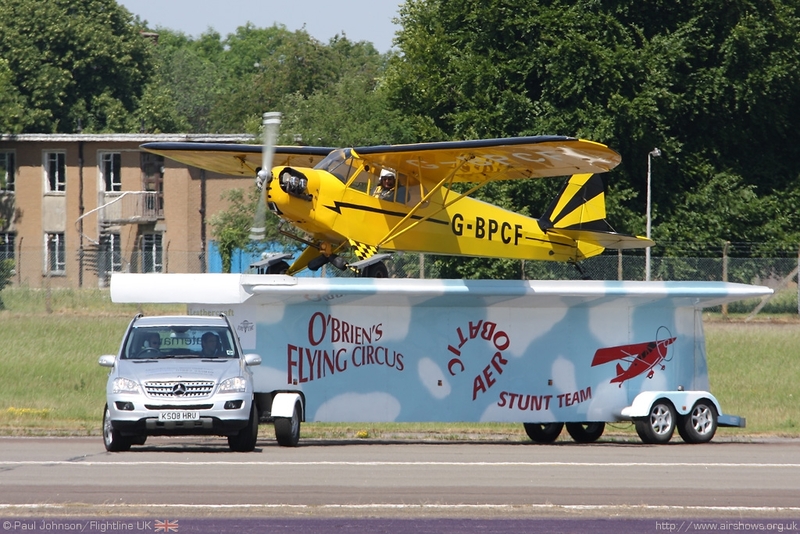 Opening the show on both days was Brendan O'Brien and his incredible crazy flying and trailer-top landing display in his new J3 Cub. 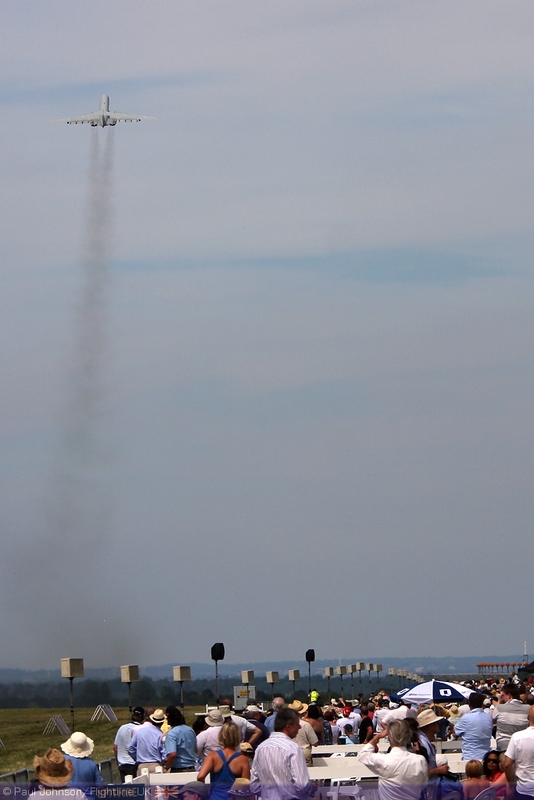 Despite a slight crosswind and turbulence due to the heat, Brendan was able to land on the trailer both days. 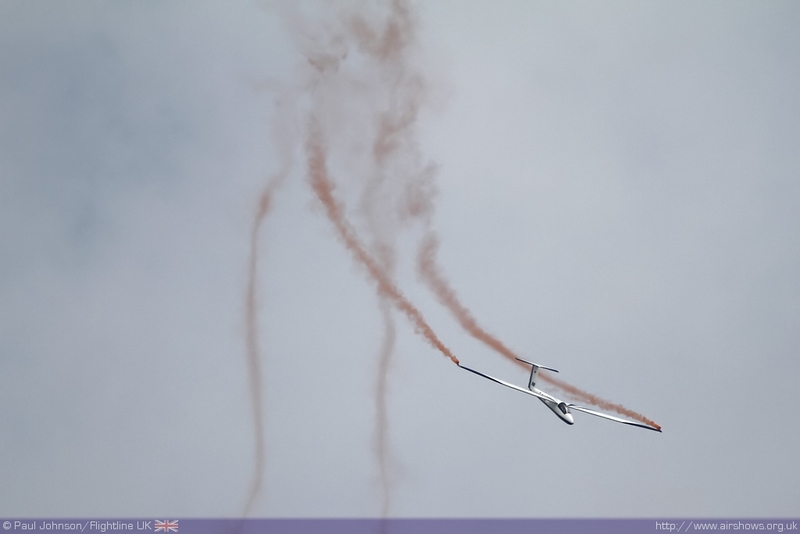 The driver of the trailer was Mike Newman who was also displaying in the show with a pretty Pilatus B4 Glider. 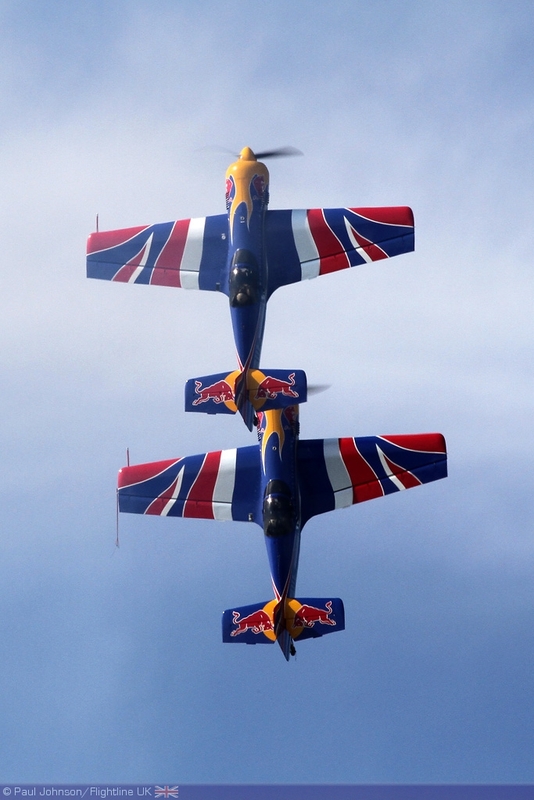 Powered aerobatic displays came from The Blades and The Matadors with the latter winning the prize for best team display on the Saturday evening. 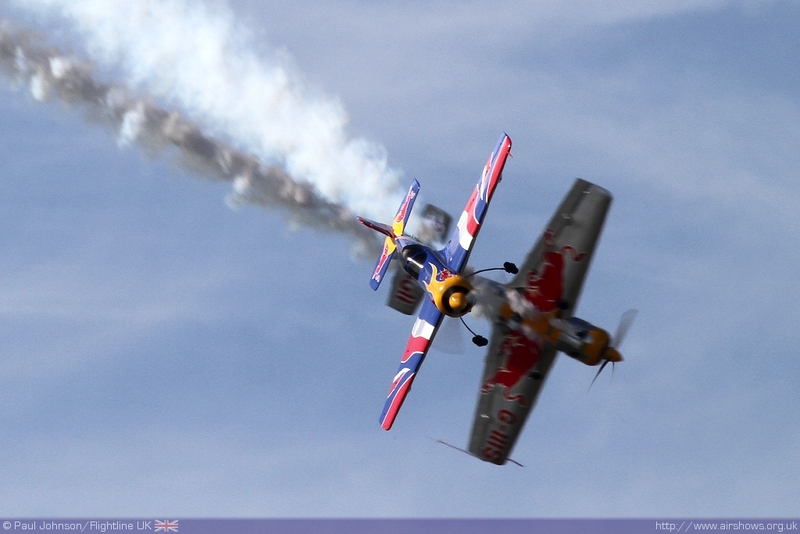 Biggin Hill International Air Fair 2010 will without doubt be remembered as a highlight of an impressive season of airshows. 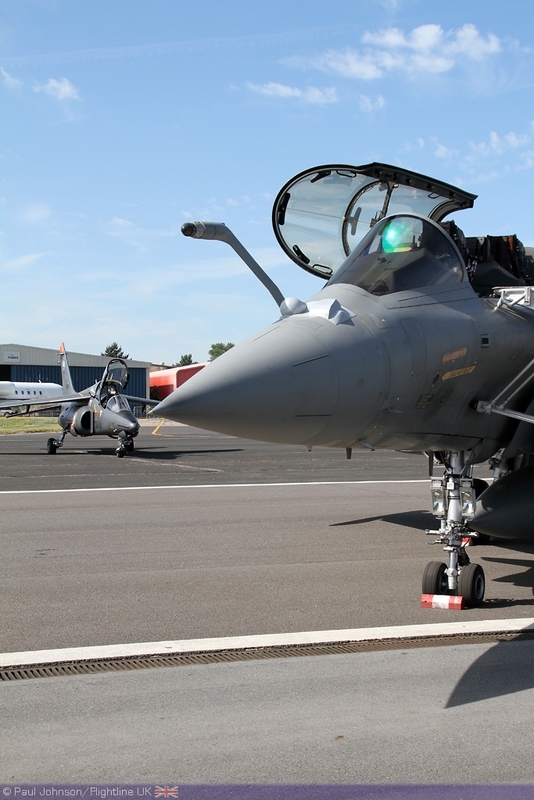 Indeed, in terms of its line up was perhaps one of the best displays in the recent history of the show. 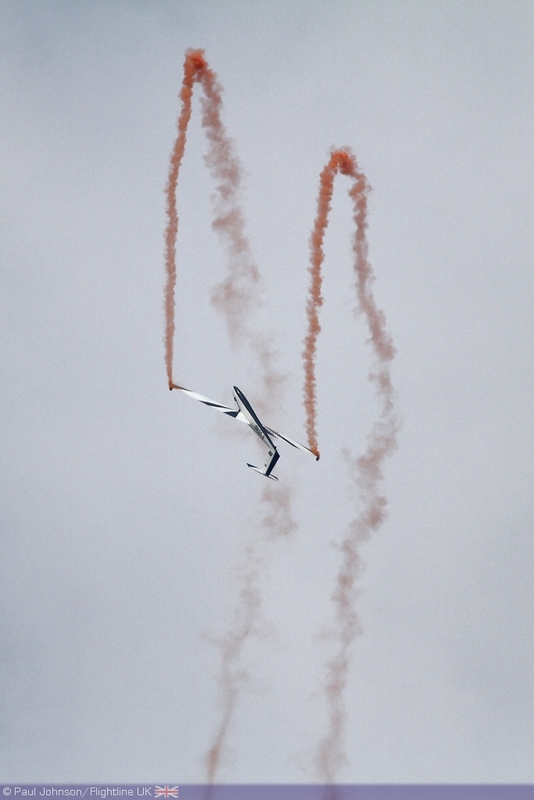 It was a shame that Sunday's show saw a couple of the acts not fly due to timing issues (the airport had to accept an executive charter during the display) but that shouldn’t detract from what was one of the best airshows of the year!